If you are at all plugged in to DC restaurants, Himitsu is on your radar. It’s been on mine since it opened in November 2016. After one too many conversations where I had to sheepishly admit I hadn’t yet dined here, I was forced to forego my reticence over the no-reservations policy and just get it over with already. I am happy to report that I can finally hold my head high. I had dinner at Himitsu. Executive Chef Kevin Tien and beverage director Carlie Steiner co-own Himitsu, an intimate Japanese-inspired restaurant located in the former Crane and Turtle spot in Petworth. My party of four -which is the maximum the restaurant will accommodate- arrives on a Saturday just before the 5:00 pm opening. There is a line, but a quick headcount gives us confidence that we’ll make the first seating. We just miss out on securing an inside table and are seated on the outside patio, where it’s hot and still sunny but not unbearable. Every single dish on the menu screams with originality. We ponder with great intensity options that range from nigari, sashimi, snacks, cold plates, and hot plates. It’s gratifying to see an abundance of vegetarian, vegan, and gluten free dishes. Himitsu’s heat factor is strong, which I find thrilling, but not everyone in our party has the same tolerance level. We’re actually challenged to find dishes among the cold and hot plates that don’t incorporate chilies or chili oil, to accommodate one of my spice-sensitive dining companions. 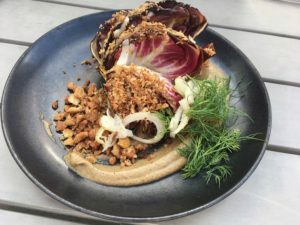 A vegetarian highlight is grilled radicchio with charred miso, eggplant pickled fennel, chili-lime vinaigrette and brown butter. The ingredients are generously showered with a layer of breadcrumbs and topped with dill rounding out the appealing plate. 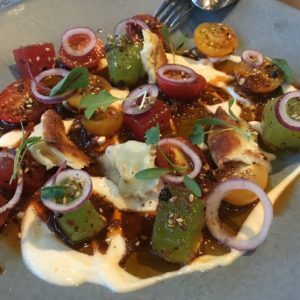 We swoon over a vegan dish of heirloom tomatoes and pickled strawberries with parsley-tarragon puree, crispy quinoa, black pepper and shiso. I wipe my brow, a gesture that is necessitated by the weather as well as an indication of my being positively overwhelmed by the flavors. Big eye tuna with compressed watermelon and schug- a fiery spice blend- produces a slow burn. Fruit and tomatoes serve to cool things down – just long enough until we’re ready to dive back in. 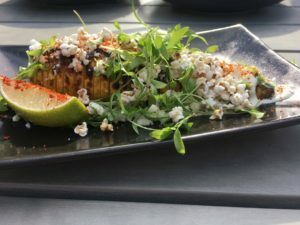 The dish that wins us over for being deceptively delicious looks like corn on the cob tossed with a layer of popcorn. It’s actually elote squash topped with cotilla cheese. The satisfying crunch is elicited from popped sorghum. Sometimes food just makes me smile. Himitsu has me grinning. 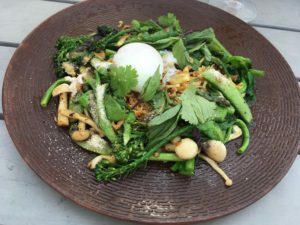 Famu yasai is a delightful meld of pea leaves, mushrooms, snap peas, and toasted rice, with a soft-poached egg on top. Chili soy dashi gives it a powerful kick. My spice-sensitive friend is still seeking that one dish which will be full of flavor, but restrained on the heat. This isn’t it. 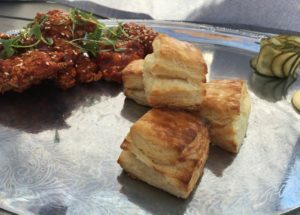 She finds it in karage and biscuits, which is fried buttermilk-brined chicken thigh with Korean gochujang glaze. The coating is spicy and sweet but not overwhelming in its fire. We follow our server’s recommendation to make a sandwich with the chicken, Kewpie mayo, pickles, and warm flaky biscuits. The biscuits are so delectable that our friends order four to take home. I wish I had followed suit. There’s a reason that this is on the Washington Post’s 40 Most Essential DC Restaurant Dishes of 2017. Cocktails curated by Carlie Steiner are notable. 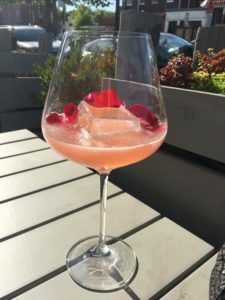 Rosé mule with rose wine, lime, ginger, rose water and rose petals is delightful, although the $18 price tag is a bit steep. Other cocktails hover in the $14 range, but this the drink that strikes my fancy and I’m game for the splurge. My only regret about sitting outdoors is that I miss soaking in the restaurant’s atmosphere. I loved Crane and Turtle and am interested in seeing how the interior has morphed into Himitsu. I don’t need an excuse to return. I’m already anxious to go back and focus on the nigiri and sashimi sessions I regretfully ignore this time around. The word “himitsu” is Japanese for secret. It’s an appropriate name, as there is an abundance of hidden gems here. But it’s certainly no secret that Himitsu is a dining destination that adds sizzle to DC’s already smoking hot restaurant scene.